Police are patrolling beaches in Devon where members of the public have been taking goods washed ashore from stricken container ship MSC Napoli. Hundreds of people have made off with valuable hauls from some 40 containers which drifted onto Branscombe beach. Police have warned them they are breaking the law if they fail to declare taking any of the ship's cargo. The coastguard said it may take a week to pump 3,500 tonnes of oil from the ship to stop more leaks into the sea. Branscombe Police officers have been patrolling the beach to prevent unopened containers from being broken into and have closed all roads leading into the village. They were also handing out forms so people could report what they had taken to the Receiver of Wreck. This must be done within 28 days, otherwise they are committing an offence. Branscombe Police's Pc Steve Speariett said "a couple of hundred people" were on the beach on Sunday night with the same number again scavenging on Monday. "Around 50 BMW motorbikes were carried off the beach last night," he added. Gareth Topping told BBC News he had pulled one of the motorbikes out of a container. "It took about eight to 10 of us to lift each one out. As each one came out the front wheels were put on, then they were taken down to the beach and over the cliffs," he said. Other products taken away included exhaust pipes, steering wheels and beauty cream, Pc Speariett added. 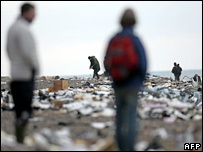 The Maritime and Coastguard Agency has warned the scavengers are making the beach clear-up more difficult by dumping unwanted debris on the beach after helping themselves to the goods from the containers. The Royal Society for the Protection of Birds has reported 600 seabirds had been found suffering from the effects of oil between Chesil Beach and Portland in Dorset, sparking fears environmental damage was worsening. The RSPCA said it is already caring for more than 80 seabirds covered with oil, with dozens more expected to be rescued. Tim Thomas, a senior scientific officer in the RSPCA's wildlife department, said: "This is an extremely distressing situation and the RSPCA is doing everything possible to help these birds." Mr Thomas said the charity already had reports of several birds which had been found dead. The Napoli, which is grounded about a mile out to sea, had also shed containers holding a 4x4 vehicle, ladies' shoes, Bibles in a foreign language and nappies. About 200 of the vessel's 2,323 containers have gone overboard, 158 of which are classed as having potentially hazardous contents. Some containers have drifted as far east as West Bay in Dorset, say Solent coastguards. Under the Merchant Shipping Act 1995, it is an offence for people to remove items from a wreck if they conceal or keep possession of cargo and refuse to surrender it, police said. Meanwhile, up to 200 tonnes of oil from the engine room, mixed with water, has leaked from the cargo vessel. But officials said the fuel contained in the ship's tanks, which have not been punctured, was their main concern. The operation to remove the heavy fuel oil could last up to a week.